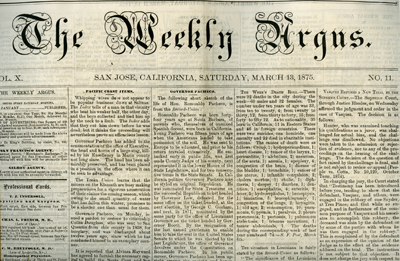 SCVHistory.com | Tiburcio Vasquez | The Weekly Argus: Vasquez Refused a New Trial, 3-13-1875. Vasquez Refused a New Trial. San Jose, Calif. | Saturday, March 13, 1875. VASQUEZ REFUSED A NEW TRIAL BY THE SUPREME COURT. Hunter, who was examined touching his qualifications as a juror, was challenged for actual bias, and the challenge was disallowed. No objections, were taken to the admission or rejection of evidence, nor to any of the proceedings on the hearing of the challenge. The decision of the question of fact raised by the challenge is final, and is not subject to review or appeal (People vs, Cotta, No 10120, October Term, 1874). In charging the jury, the Court stated that "Testimony has been introduced before you, tending to show that the defendant, Vasquez, and others, were engaged in the robbery of one Snyder, at Tres Pinos; and that while so engaged, and in furtherance of the common purpose of Vasquez and his associates to accomplish this robbery, the deceased was slain by the defendant or by some of the parties with whom he was then engaged in the robbery." This is complained of by the defendant as an expression of the opinion of the Judge as to the effect of the evidence adduced on the trial. The instruction is not subject to that objection. it does not charge the jury with respect to the evidence, nor as to what facts are thereby established. An instruction is not pertinent in any sense proper, unless given in view of the evidence as tending or not tending to prove some fact in issue; and it could not be erroneous for the Court to state to the jury correctly, as was done in this case, the state of the evidence in respect to which the instructions were given. The tenth instruction is as follows: "It is no defence to a party associated with others in, and engaged in a robbery, that he did not propose or intend to take life in its perpetration, or that he disapproved or regretted that any person was thus slain by his associates. If the homicide in question was committed by one of his associates engaged in the robbery, in furtherance of their common purpose to rob, he is as accountable as though his own hand had intentionally given the fatal blow, and is guilty of murder in the first degree." Several of the preceeding instructions relate to the same legal proposition. The instruction is in entire accordance with the provision of the statute, which declares that murder which is committed in the perpetration of an attempt to perpetrate robbery, is murder of the first degree; and no argument is required to sustain it as a clear and correct statement of the law on that point. Chief-Justice Wallace and Justices McKinstry and Crockett concur.